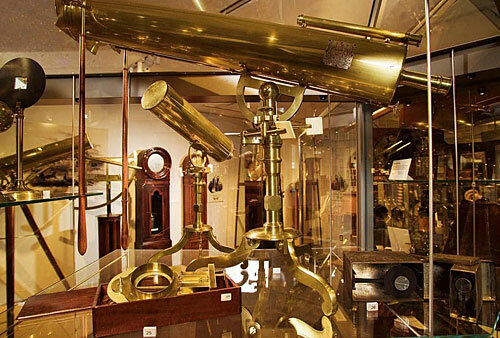 Hollis professor John Winthrop observed in Cambridge the transit of Venus of 1769 with this 24-inch Gregorian reflecting telescope by James Short, London, 1764. At last, Harvard’s Collection of Historical Scientific Instruments has come up from its hiding place in the basement of the Science Center to reveal itself, radiantly, in the new Putnam Gallery on the main floor. That is, some 400 of its more than 20,000 objects have taken up permanent residence in the 2,000-square-foot gallery. Another 1,000 square feet of gallery space on the floor above houses temporary exhibitions staged by faculty members, students, and invited artists and researchers. The instrument collection, one of the greatest in the world, is unusual, says Schechner, because of the documentation in hand about the provenance and early uses of so many of its pieces of apparatus. Many were employed at Harvard, by graybeard faculty members or eager students, and the gallery features these, although not exclusively. “The collection has become fully integrated into the research and teaching of the department of the history of science, offering support for work by undergraduates, graduate students, and faculty, as well as researchers from around the world,” writes Allan M. Brandtchair of that department, director of the collection, a professor of the history of science and, at the Medical School, a professor of the history of medicinein a pamphlet of essays given out at the gallery. He adds that the collection serves also “as a means of educating the general public about the important roles played by material culture in the making of modern scientific disciplines.” A broad range of those is represented, from astronomy, navigation, and surveying to geology, physics, medicine, mathematics, and communication. The collection was established in 1949 by David P. Wheatland, later joined by Ebenezer Gay, to save the University’s significant scientific apparatus from being cannibalized for parts or discarded because no longer used. At first, physicist Wheatland kept the instruments in his office in Cruft Laboratory. The collection moved to the basement of the Semitic Museum, to the basement of Perkins Hall, to Allston Burr Lecture Hall, and, in 1980, to the Science Center underworld. Curator Schechner still forages, and snatched up the control panel of the Harvard cyclotron when that facility shut down in 2001. Today’s obsolete technology may be tomorrow’s museum piece. The Putnam Gallery can be found near the east entrance of the Science Center, at 1 Oxford Street in Cambridge, and is open to the public, free of charge, from 11 a.m. to 4 p.m., Mondays through Thursdays. Celestial globe by John Senex, before 1740, with additions by Benjamin Martin, London, 1757. Behind it, left, is an air pump with flywheel for rotating and rubbing objects together in vacuo, by Abbé Jean-Antoine Nollet, Paris, ca. 1746. In the background, the Grand Orrery by Joseph Pope, Boston, 1776-1786. This mechanical model of the solar system was acquired by Harvard with funds raised by a lottery in 1788. The celestial dome is supported by bronze figures cast by Paul Revere. Professor of the history of science Mario Biagioli notes that instruments of this period were classified as mathematical or philosophical. Mathematical ones were meant to get a specific job done, such as finding time (see the sundials below). The air pump is an example of a philosophical instrument, expected to provide new insights into how nature works. All Harvard students of the seventeenth and eighteenth centuries were required to learn how to make sundials. The collection includes numerous portable dials; note the one in the shape of a viola da gamba, likely French, ca. 1620, for use by a lady. Some dials, like a Swiss Army knife, contained many useful tools. On the shelf, numbered 8, is a geometrical and military compass, made to Galileo’s specifications by Marcantonio Mazzoleni, Padua, ca. 1603, for presentation to the Duke of Mantua. The duke could have used it to aim his cannon and calculate the amount of powder for a shot of a certain bore and material. Not a philosophical instrument. A case of acoustical artifacts. At top are eight stoppered organ pipes by Rudolph Koenig, Paris, ca. 1889. In front of them is a photographic record of sound waves produced by a phonodeik made by Dayton C. Miller, Cleveland, 1909. On the lower shelf, Helmholtz resonators for sound analysis, also by Koenig, ca. 1865. Resonators were tone detectors, being tuned to respond to specific frequencies of sound. Just as a prism could separate light into colors, a bank of resonators could sort sound into elemental tones. Hermann von Helmholtz’s resonators confirmed Ohm’s theory that complex sounds were the Fourier sum of simple sinusoidal sound waves, or harmonics. From left: Culpeper-type compound microscope with original box, by Matthew Loft, London, ca. 1724-1740. Cuff-type compound microscope by Claude Simeon Passemant, Paris, ca. 1745-1769. “Great double” compound microscope by John Marshall, London, ca. 1693.